Berzerker_prime's Adventures at Anime Central 2002! Anime Central was my very first experience at an Anime convention. And thrilling it was! I got to meet Brad Swaile and Crispin Freeman, two of my favorite voice actors and for the very first time I got to participate in a cosplay competition. Along with four other people from Anime Club of University Wisconsin - Madison, I cosplayed as Milly Thompson from Trigun. 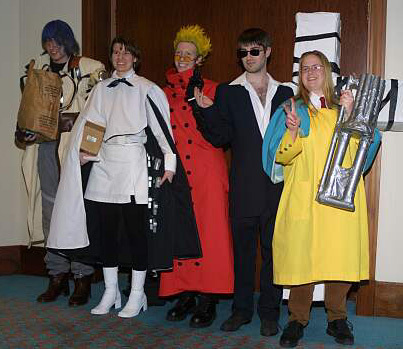 We faced stiff competition, as Trigun was a popular thing to cosplay that year, and we didn't win anything. But, our skit got the laughs it was supposed to get and more. All in all, the innagural cosplay of The Gung Ho Otaku, went very well and we had lots of fun. Fast facts: I was the only Milly Thompson at the convention (1 of 3 that I know about) who was actually a girl. 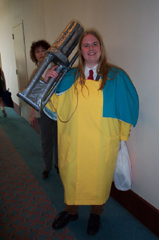 The Gung Ho Otaku boasted the largest Wolfwood Cross-Punisher at the convention. Also included in the skit were Megan Fellows as Vash the Stampede, Deanna Morrison as Meryl Strife, Dave Hogle as Nicholas D. Wolfwood, and Joseph Barrington as Legato Bluesummers (group picture below). This page is dedicated to the loving memory of To, the Cross Punisher. May you continue to be full of mercy in the cosplay prop afterlife.